Charlie Hockett bikes for cities! Studying Geography has caused me to see the world with an interesting lens. When thinking spatially and learning about the importance of scale, I feel that my education has helped me interpret my surroundings in a new light. I finished my degree in the Fall of 2014 an d have since rode from New York City to California on my bicycle. 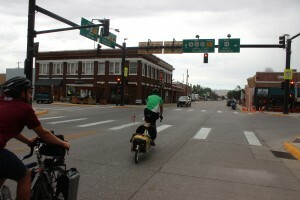 Along the way my partner and I have been filming a documentary called Westward Wheels which is about us exploring how American cities can be more healthy, sustainable, and bike friendly. It was during the many classes and discussions in Condon Hall that my interest in the urban landscape was formed. In Geography I learned to see how systems interact with each other over physical space. Having grown up in urban Southern California I started to become more and more interested in how cities are able to support so many people living in one place. The more I learned, the more concerned I became for the future of the people and landscapes around me. I became inspired to explore ways to improve the social, economic, and environmental fabric of cities. All the while I was living in one of the most bicycle friendly communities in the country. 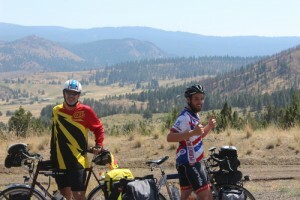 As I began to spend most of my fre e time on a bicycle I started to see the connection between my two passions. Bicycling is beneficial for the individual and the community. I believe that my background in Geography helped me understand that on a more holistic scale. As I finish my journey and return to my home town to edit and produce the documentary, I am looking towards a Masters Degree in Urban Planning so that I can enter the word of bicycle advocacy and share the happiness that riding my bicycle has brought me. GeoDucks Alumni Blog! 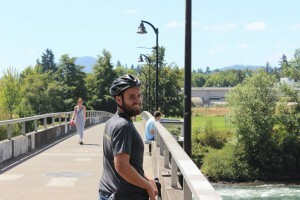 » Charlie Hockett bikes for cities!